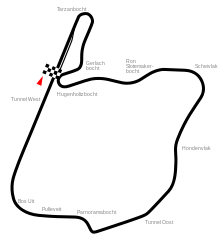 The 1973 Dutch Grand Prix was a Formula One motor race held at Zandvoort on July 29, 1973. It was race 10 of 15 in both the 1973 World Championship of Drivers and the 1973 International Cup for Formula One Manufacturers. Zandvoort returned to the Formula One calendar following a year's absence for extensive safety upgrades to the race track including new asphalt, new barriers and a new race control tower. Jackie Stewart won the race, this Grand Prix being fourth of five wins for Stewart during the 1973 Formula One season, and he became the most successful Formula One driver of all time with his 26th Grand Prix victory, surpassing Jim Clark's record of 25 victories. Stewart's friend and future world champion James Hunt scored his first podium finish. Driver Roger Williamson was killed in the race; this was the first of two driver fatalities in the 1973 season. François Cevert, who took the podium in second place at this race, would later perish during practice for the 1973 United States Grand Prix. The burned wreckage of Roger Williamson's March 731. On the eighth lap of the race through the high speed esses near the Tunnel Oost (East Tunnel) right-hand corner, a suspected tyre failure caused Williamson's car to pitch into the barriers at high speed, and be catapulted 300 yards (275 m) across the track, eventually coming to rest upside down against the barriers on the other side. The petrol tank had ignited whilst being scraped along the track, and the car caught fire. Williamson had not been seriously injured by the impact, but was trapped in the car. The race was not stopped and continued with a local yellow at the scene, a fact which would become significant over the next few minutes. Fellow driver David Purley, who witnessed Williamson's impact, almost immediately pulled his car over on the opposite side of the track, then ran across the live racetrack to assist him. Williamson was heard shouting to Purley to get him out of the car as Purley tried in vain to turn the car upright. There appeared to have been ample time to right the car and pull Williamson out, but as desperately as he tried, Purley was unable to do it by himself, and the marshals, who were not wearing flame retardant overalls, were unable to help due to the intense heat. Race control assumed that it was Purley's car that had crashed and that the driver had escaped unharmed. Many drivers who saw Purley waving them down to stop later claimed that they assumed Purley to be trying to put a fire out from his own car, having safely exited it, and thus did not know that a second driver had been involved. As a result, the race continued at full pace while Purley desperately tried to save the life of Williamson. There was only a single fire extinguisher in the area, and it was not enough to put out the fire. With the car still burning upside-down, the situation became hopeless, and the distraught Purley was led away by a marshal. Some spectators, appalled at Williamson's plight, tried to breach the safety fences in order to assist Williamson, but were pushed back by track security staff with dogs. With the race still on, it took some eight minutes for a fire truck to completely travel around the circuit with the flow of race traffic. By the time the car was eventually righted, and the fire extinguished, Williamson had died of asphyxiation. A blanket was thrown over the burnt-out wreck with Williamson still inside, and the race carried on. Purley was awarded the George Medal for his brave actions in trying to save his fellow sportsman. Williamson's remains were later cremated and his ashes transferred to an undisclosed location. In an otherwise uneventful race, Jackie Stewart won his 26th career Grand Prix and broke Jim Clark's 5-year-old record of the most career Grand Prix victories. Note: Only the top five positions are included for both sets of standings. Only the best 7 results from the first 8 races and the best 6 results from the last 7 races counted towards the Championship. Numbers without parentheses are Championship points; numbers in parentheses are total points scored. ^ "1973 Dutch Grand Prix". formula1.com. Archived from the original on 7 September 2014. Retrieved 22 December 2015. ^ a b "Netherlands 1973 - Championship • STATS F1". www.statsf1.com. Retrieved 15 March 2019. 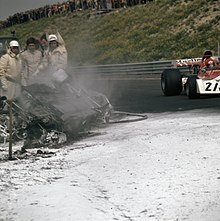 Wikimedia Commons has media related to 1973 Dutch Grand Prix. Admin. "Formula 1 complete – all access F1 – Williamson, Roger". Archived from the original on 2009-06-22. Retrieved 2009-06-19.